Drop videos, audio, and image files straight into the structure of your story. 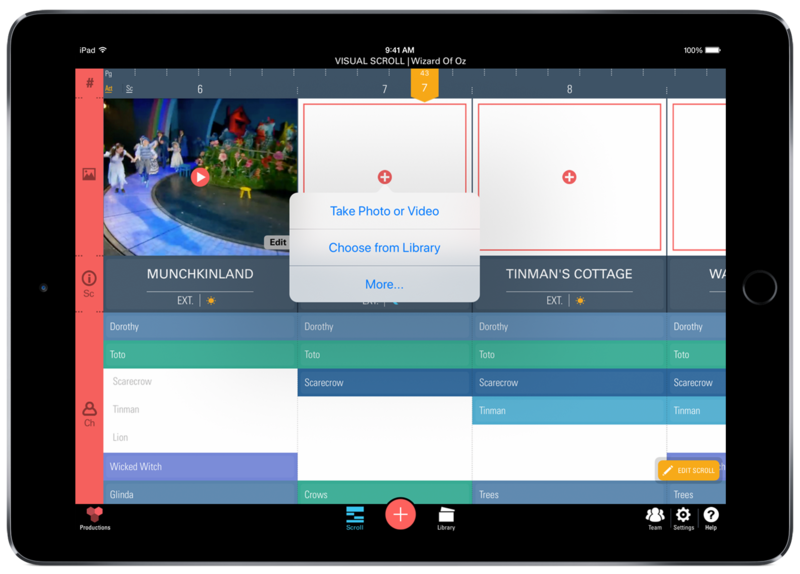 Now that you have your structure laid out in the visual scroll, it's time to fill it in with bits of inspiration or production elements - whether video, music, pictures, or documents. * To learn more, you can watch our video guide and/or check out our step-by-step instructions below. Select "More" to choose a connected file management app like iCloud Drive, Dropbox etc. To add a poster media, tap on the red plus (+) button like so. You can also select a file from the Scene's Moment Box to set it as the Scene's poster. 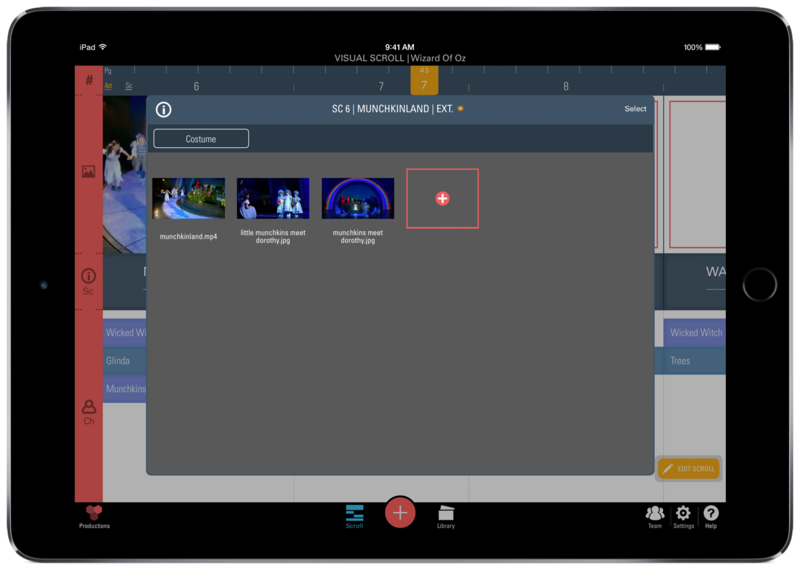 To upload media to your production, tap on the red plus (+) button in the bottom bar. Let's use media from Dropbox for this example. Tap "More", then "Browse" to access your Dropbox folders. 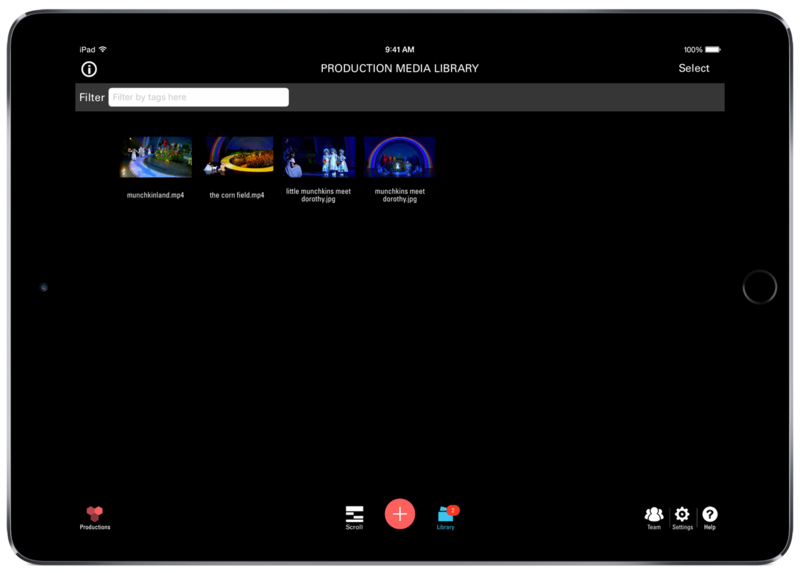 Navigate to the appropriate folder and select the piece of media you'd like to import. Once selected, you should see a progress marker to the right of the selected file. Tap on the "Library" icon on the bottom bar to see all your uploaded files. The number by that icon tells you how many pieces of media have not been assigned a tag. In this case, the last two photos are untagged, and we want to assign them to a scene. Tap "Select" on the top right corner. You're now be able to select multiple files. To have the two photos appear in "Munchkinland", select them both and tap the green tag icon at the bottom. This pulls up the tagging window, where you can search for the Scene or Character. In this case, search "Munchkinland" to pull up that Scene tag. When the tags appear upon searching, just tap on them to assign them to the selected media. You may decide to add these photos to the "Munchkins" Character track as well. You may also want to assign them a "Costume" tag, since you really just want these pictures to reference the cast's costumes. When you're done with tags, tap "Apply" at the top right of the window. 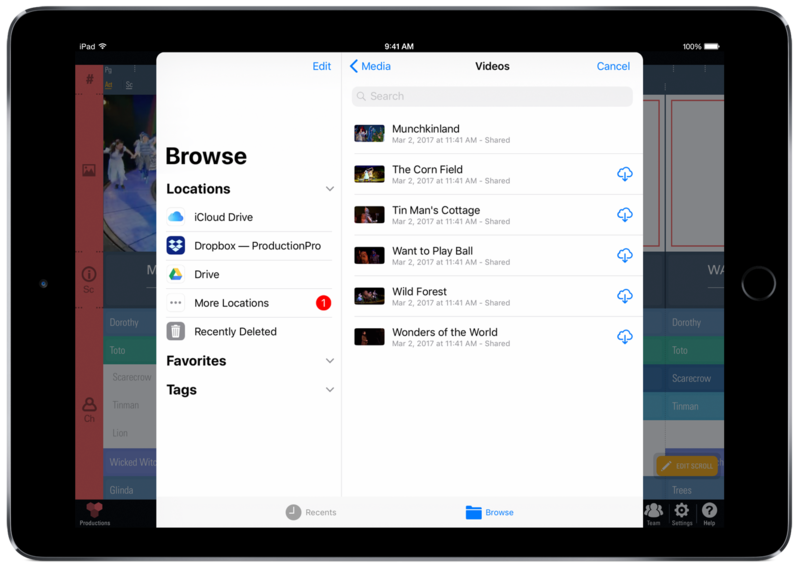 In the Visual Scroll - Tap on "Scroll" in the bottom bar to navigate back to your Visual Scroll, and go straight to "Munchkinland" and tap the Scene Title to open up your Scene Moment Box. You'll see your photos there, and the "Costume" filter up top. This Moment Box filter will be very useful for when you have multiple pieces of media and you'd only like to see your costumes. Simply tap the filter to see all media tagged "Costumes". Directly into the Scene or Character Moment Boxes. Please make sure your file size does not exceed 900 MB to ensure a smooth upload. If you would like to increase your file size upload limit, please email or chat with us to upgrade your account. **You may experience a slight wait for a video upload, but as long as you get a "Large File" popup, it will be appear as soon as it fully uploads onto ProductionPro. How do I organize and view all uploaded media?